Today, with our seventh grade camp, we continued our theme of needs in modern living by focusing on shelter. 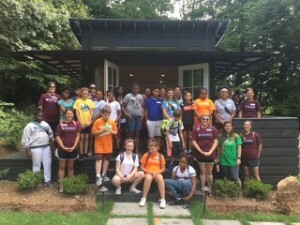 We had the opportunity to visit Clayton homes where we toured two tiny houses and heard about the engineering behind these homes. Later in the afternoon, our campers built their own shelters using their new knowledge of engineering and house structures. Thank you to our two judges, Perry Morin and Jonathan Robinson. Although not many of the structures withstood the elements (water bucket), the kids had a blast with the competition! We then ended our day by returning to our water theme with a presentation from KUB. The kids saw the materials and lab attire that these scientists use when dealing with water sampling and filtration. Day 2 was a success! Please continue to pray for our campers, counselors, and directors. Day Two of 8th grade camp was even better than our first day! Today we went to Ijam’s Nature Center and learned about Mead’s Quarry. Dr. Cathey and Professor Mead discussed how people, throughout history have used natural resources. The students learned that the marble coming from the quarry was used to build floors and statues. They even questioned how people mined from quarries for the sake of wealth, and they did not always think of the effects it would have on the environment. After lunch, the students participated in a game involving the competition between invasive plants and native plants. During this game, one student pointed out that he would probably not “survive” the game because he knew native plants were weaker. He made an incredible connection between what he had learned in history about Native Americans and diseases and connected it to the struggle between invasive and native plants. Finally the leaders and students worked together to build a page of their website, based on the effects of exploitation of resources. The students worked so hard and produced insightful information on the topic! Dr. Cathey even challenged a student to a push-up contest and WON! We are excited to see what the rest of the week holds and how these students will continue to grow!